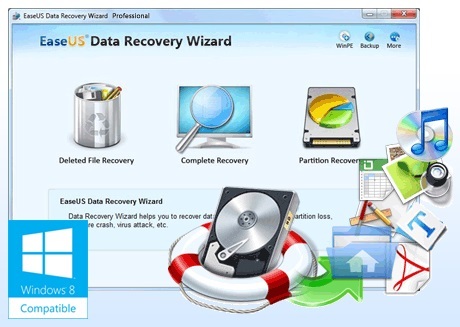 EaseUS Data Recovery is a one stop solution for restoring data on your PC and covers almost all hard drive file system types with maximum compatibility. The software works for all windows OS versions and the package is light weighted which comes as a 6MB zipped file with various features internally built. 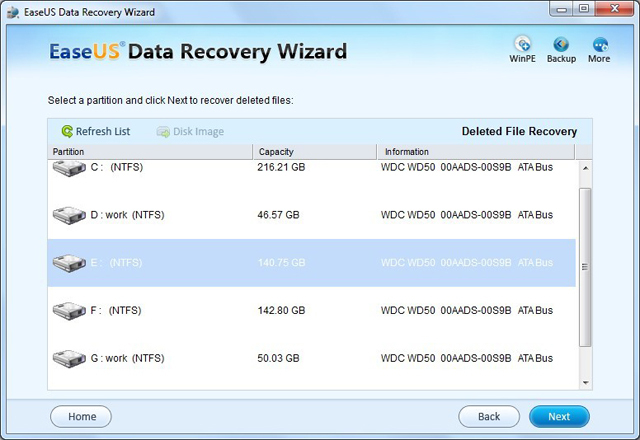 The recovery wizard is capable of restoring any file type on your system. Additionally this has a built-in thumbnail viewer for images. 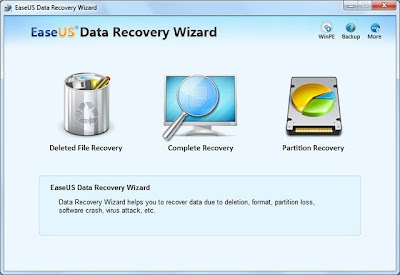 EaseUS Data Recovery Wizard is very fast and effective when doing the actual recovery work. While scanning or displaying the results it does the work without any lag. Without revamping your hardware the program does a full scan with multiple hard drives on one system. Interface is very smooth and acknowledging. This segment supports recovering individual files on the system which has been deleted a long time before. This action decisively doesn't mean just the user action, it also recovers the files which has been depleted by Virus, Trojan or because of any other crash. Users can restore files if it's not corruptive or broken. 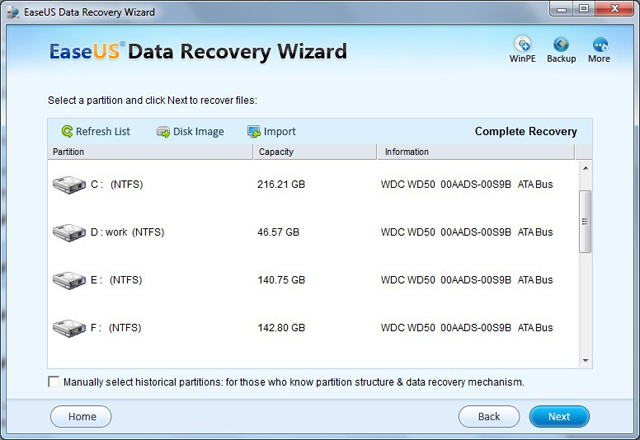 The remaining recovery segments are for the file systems where partition is damaged. When partitions are not found in the complete recovery module this particular Partition Recovery comes into picture. This process is analogous to the preceding process. A Complete check list of hard drives are displayed and the end user can select any drive or disk image to scan for recoverable partition. When you select this recovery module, select the file types you want to recover and then you will see a list of physical devices that are connected to Host Computer. This particular component has been devised if the drive is not operative. This scenario arises when there is a hard disk crash, accidental formatting or other forms of corruption. The introductory screen displays the lost hard drives again and users can weed the disk image they want to process in lieu of one of the connected hard drives. Then the selected disk image or hard drive is then processed by the recovery software. This particular component searches for files, partition tables, boot records, folders and other information. 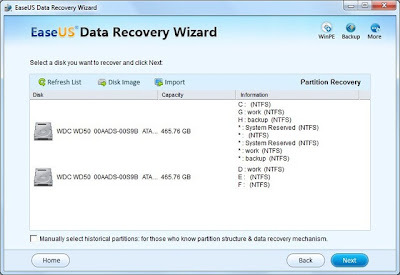 A check list of partitions is laid out to the user at the end. A diversified information from storage size to files, folder matches and an instruction that depicts that it is the right partition of the drive. If there are no information on the latter, you can exit the process and start the partition recovery module in lieu of that. 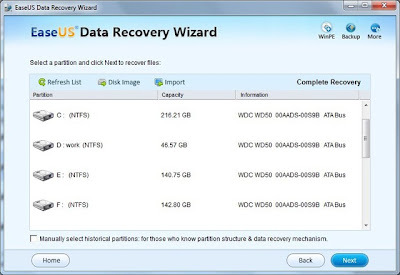 Maximum number of partitions opted can be four, in this complete recovery module. Supports not only hard drives but also USB drives and storage, e.g. digital camera cards. EaseUS Data Recovery wizard is a boon for users who want their files to be retrieved back on the system at any cost. As this software is open to all windows OS, its features should be copious for the majority of file recovery stages that end users encounter. EaseUS also boosts of world's most powerful data recovery software for iPhone, iPod, iPad called EaseUS MobiSaver which can be used to recover deleted Contact, SMS, Call history, Notes, lost Photo, Video & MMS.